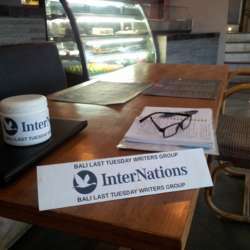 You must be a member of the Bali Last Tuesday Writers Group to attend this activity. Would you like to join this group? Friendly group of writers and hope-to-be writers gather to write and inspire each other. We don't worry about spelling, grammar, punctuation, or style. Just bring a pen & paper or on your laptop to write just for the joy of it. Stuck for something to write about? We can help you, because we have all been there at well. Happy Writing!